Meet the Creators of FLASH POINT! A week ago, we published the amazing FLASH POINT! series on to Inception, which provides an immersive 360° look at photographing the 1992 L.A. 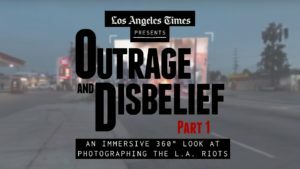 Riots, created by Sleepy Puppies VR and the LA Times. The series presents photographs taken during the riots with accompanying VR short films that place our audience right back in the moment the photo was taken, and include interviews with the photographers, archival audio and modern day footage as to more effectively draw a connection between what happened then and now. To mark the launch of the pieces on our app and Black History Month, we had a chat with the creators – Sleepy Puppies VR, a.k.a Molly Gale & Jancarlo Beck. Q: Please tell us about yourself – a bit of background. Why did you choose ‘Sleepy Puppies’ as your studio name? How did you decide to team up? We started working together in 2015! We met at Park Pictures where Molly was working as their in-house Production Coordinator and I was working under the mentorship of Director/DP Lance Acord. During our time there we started developing side projects on the weekends and that quickly grew to a full-time production company. As far as how we settled on Sleepy Puppies as our company name, let’s just say if your dogs were as cute as ours when they’re snoozing, you’d name your company Sleepy Puppies too! Q: Can you tell us about your inspirations for the Flashpoint! series? Strangely enough, the spark of inspiration for this project came while watching an episode of Anthony Bourdain’s show “Parts Unknown” in which he interviews Roy Choi about living through the riots in Koreatown in 1992. The more we dove into the stories, the more we were shocked by our own lack of knowledge about some of our favorite areas of our city. There are all of these young people moving in and out Los Angeles with no idea what happened in their own neighborhoods just 25 short years ago. So, in a way, Flashpoint was an effort to break that cycle. Q: What was interesting about this particular content for you to dive into documentary? What are the messages you wanted to send out (e.g. black history) with your piece? Hate and bigotry are issues that Americans — and the whole world, really — are still very much grappling with. If you look at the 1992 Riots as almost a “case study”, you’ll see that so many pieces of this event actually mirror the discord in our current society. The LA Riots are a cautionary tale of what can happen when the consequences and implications of long-term systematic racism comes to an angry, violent boiling point. Q: Tell me about the creative process – why VR? Did you always know you wanted to create something in VR or did it just seem like the right medium for this piece? What are the difficulties you’ve encountered in the shooting and producing processes? It’s funny, actually — we never imagined ourselves working in VR when it first started gaining some traction. We were both trained pretty traditionally, but we approach every project with one guiding question: What is the best way to tell this story? VR is a game-changing tool for documentary and education. Instead of telling your audience a story, you’re letting them experience it. And that’s exactly what we wanted for this project — we wanted our audience to be able to experience the 1992 Riots as close to first-hard as technologically possible. We wanted them to feel the juxtaposition between this insane history and their present day lives. With it’s immersive and experiential capabilities, VR as our medium was the clear choice. Q: Do you have any plans for another VR project? Is it likely to be on a similar theme, or something completely different? We definitely do! We are always reactive to our environment when developing projects and right now we think one of our most important jobs is to bring light to stories about human rights and fights for equality. We have a couple ideas brewing that tackle this goal in different ways — we’re looking forward to bringing them to life. Make sure that you always have a concrete answer to the question “Why am I using VR?” A lot of people are using 360° without any intention or purpose — so before you jump into VR, make sure that it’s really serving your project best. And if the answer is “yes”, don’t be afraid to make something awesome and ambitious that you’ve never seen made before! Hmm, maybe just thank you for watching! We hope you enjoyed it and that you took something away from it.